If you love Chocolate Chip Cookie Dough straight out of the batter bowl or in ice cream, you'll love this next recipe! A small piece goes a long way! It's well worth the work! Mix the chocolate wafer cookie crumbs with 2 tablespoons of the white sugar, and the melted butter. Press firmly into the bottom and 1/2 inch up the sides of one 9 inch springform pan. Bake at 350 degrees F (175 degrees C) for about 8 minutes. To Make Cookie Dough: In a bowl beat 1/4 cup butter or margarine with the brown sugar and 1/4 cup of the white sugar. Stir in the water and 1 teaspoon of the vanilla. Beat in the flour and the semisweet chocolate chips. Stir until combined. 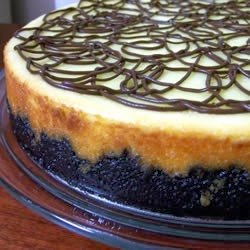 To Make Cheesecake: In a food processor or with a mixer beat 1 cup of the white sugar, and all the cream cheese. Add 1 cup of the sour cream, the eggs, and 1 teaspoon of the vanilla. Mix well and pour into prepared crust. Drop cookie dough in 2 tablespoon portions evenly over the top of the cake, pushing dough beneath the surface. Bake at 350 degrees F (175 degrees C) for about 40 minutes. Cake will jiggle slightly in center. Spread topping over hot cake. Let cake cool than chill in a refrigerator until cold, at least 4 hours. To Make Topping: Mix the remaining 1 cup sour cream, 1 teaspoon vanilla, and the 2 teaspoons white sugar until smooth. Spread over hot cake.